A BTP Scotland officer has taken the fight against cancer literally, by jumping into a boxing ring to raise money for Cancer Research UK. 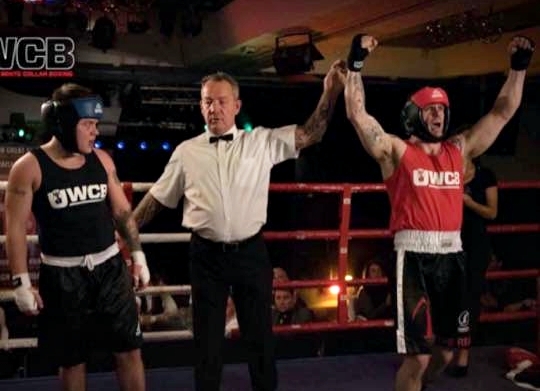 A long-time fan of the sport, Joe Roy recently took part in an Ultra White Collar Boxing charity event in Renfrew. Several of Joe's family members and friends have been affected by cancer, which prompted him to get involved. Joe hadn't boxed before so paired up with an ex-professional who put him through a gruelling regime of circuit, cardio-vascular and weight training as well as adjusting his diet. Joe trained five days a week for eight weeks in preparation for the fight, which saw him take on a 28-year old who had fought in several previous bouts. "I was ever so happy to hear the final bell. The feeling of winning after all those weeks of crazy training was absolutely incredible and having everyone shout your name end is unlike anything I have ever experienced before." Joe raised £790 for Cancer Research UK and applied to BTP Federation for a grant to boost his total to £1000.